When ghd reached out and kindly offered to upgrade my straightener to their gorgeous White Platinum option I was ecstatic. I've actually never owned a straightener that costs more than maybe $35 dollars, so I was excited to test out a premium model. The timing couldn't have been more perfect since Jen Atkin's line, Ouai had also just made it into my life. My hair was ready for a revamp! The technology ghd includes in their straightener promises 'safer for hair heat' that will help protect and keep your hair healthy. This is something that I can tell a difference with, while the tool is hot, and does it's job flawlessly it seems less harsh on my hair. I never feel like my hair is burning or so hot I can't touch it after I pull it through. With three sensors in each plate, the straightener provides even heat for styling. Another bonus - it heats up lighting fast. I actually prefer to curl my hair with my straightener over a wand, I find it's easier to do this with my hair length. It also helps me to achieve that lived in wave that isn't too precise or overly curled. Read on below to get an idea of the steps I go through to get my hair looking effortlessly curled. While my hair is damp, I run two pumps of Ouai's Hair Oil through my ends. This oil is so lightweight, smells amazing, and never makes my hair feel greasy. Makes my hair incredibly polished. I rough blow dry my hair to finish getting the dampness out & brush through with my ghd paddle brush. Next, I grab my straightener and a roughly 1" / 1.5" thick piece of hair. I place the hair inside the straightener and turn it a full 360 degrees and then pull it down. This gives that nice wave to the middle, but keeps the ends straight. While the piece is still warm, I run my fingers through it to help break it up and keep things nice and loose. I repeat steps three and four, alternating directions I twist the straightener. One main thing - I don't curl my whole head. I pick and choose areas and leave a good portion straight. My last step is to spray a bit of Ouai Texturizing Spray into my roots. This product is brilliant, it smells amazing, gives volume, but it's never crunchy. I can't feel this product in my hair at all. It helps to give texture, hold the hair in place, and even acts as a bit of a dry shampoo. What is your go-to style for every day? 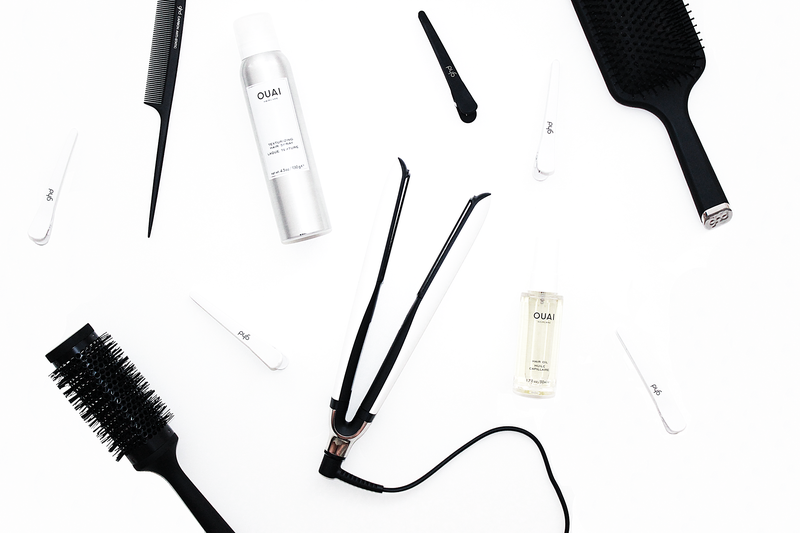 Do you own any ghd products? Have you tried Ouai yet? *ghd kindly gifted me all ghd product in this post. All Ouai product has been purchased by me. None of this is sponsored, as always all opinions are my own!